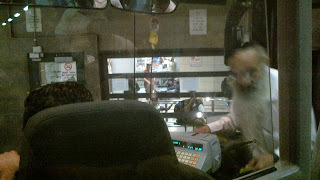 Another week, another bunch of intercity buses,as I make my way out to historic Shiloh, home of http://shilohmusings.blogspot.com as well as a small monthly women's Rosh Chodesh davening/Torah gathering. I'm sure I will have much to report afterwards, But meanwhile, I just need to mention one of my favourite Israel things ever: when a bus pulls up after a long wait, everyone, no matter where they're going and, seemingly, no matter how long they've lived here, piles randomly into the doorway to ask the driver if he's going to their destination. Asking is almost always pointless; the routes rarely, if ever, change magically to accommodate every single passenger's deepest desires. But the drivers, blunt and rushed though they sometimes seem, and as annoyed as they usually act when forced to give directions, for example, apparently never tire of answering. I personally think this habit is awesomely beautiful, a reminder of the kind of hope-after-millennia-of-hopelessness that earned us our own country back after all those hundreds of years of "pointless" tefillah. I'm glad you made it to Sha'ar Binyamin safely. Tomorrow to doven at Tel Shiloh, where the Mishkan had stood for almost 400 years.